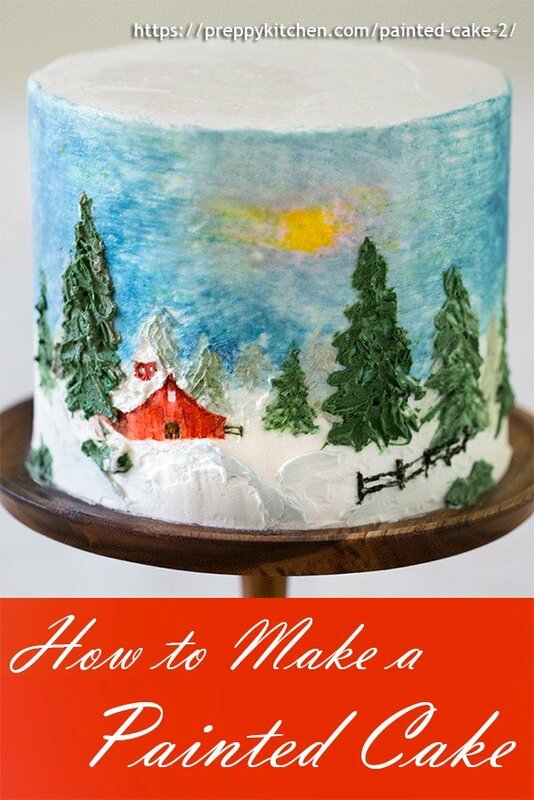 This show stopping cake features a winter scene painted with BUTTERCREAM! This technique is much easier than you’d think and so fun to execute. Painting can be so relaxing and eating cake is a favorite hobby of mine. Why not combine the two into one delicious masterpiece?! 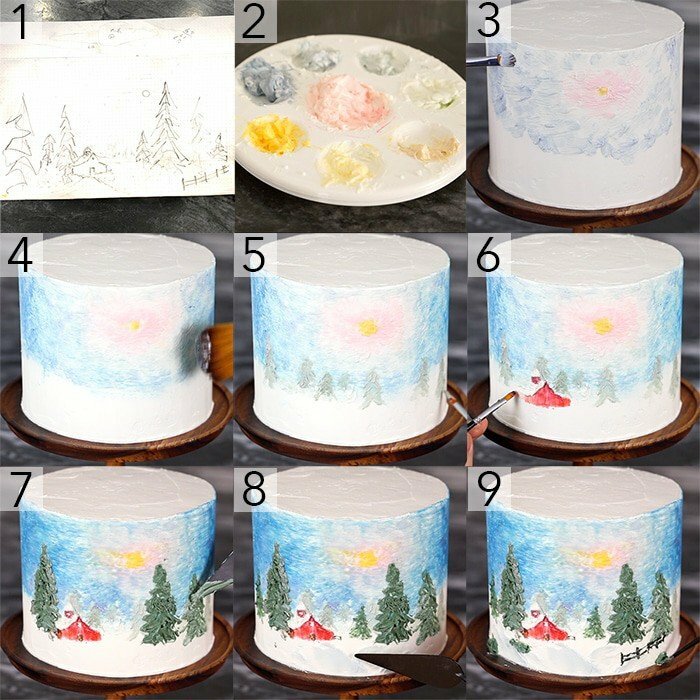 How do you Paint with Buttercream? First off gather the tools you’ll need. Food coloring, some clean brushes and/or a palette knife or two. Bake a cake and whip up some Swiss meringue buttercream. You can use other frostings but this one is the most forgiving. Smooth the cake and chill, you want a firm surface to work on. Sketch out your idea, mix some colors and get to work! It’s easiest to paint from back to front. Lay out your background, get it to a place you’re happy with then move to the mid ground and then the foreground. Use a toothpick or skewer to sketch details and remove buttercream. If things are getting too soft, chill the cake until firm. Preheat the oven to 350 degrees F. Butter and flour four 6” pans (I recommend using cake strips as well). Use a food processor to grind up the graham crackers then whisk all of the dry ingredients together in a medium bowl. Mix the buttermilk, vanilla and sour cream in a separate bowl. Cream the butter in a stand mixer and add the sugars. Mix them together until they are light and fluffy, then add the eggs and one egg white in one at a time mixing until incorporated. Add the flour mixture and the buttermilk mixture in alternating batches. Start and end with the flour mixture. Mix until just combined and give the bowl a final scrape down. Pour the batter evenly into your pans and bake for about 30 minutes or until a knife inserted in the center, comes out clean then allow time to cool. Separate the egg whites and place them in a glass bowl with the sugar and salt then give the mixture a brief whisk. Prepare a pot with simmering hot water and make sure the bowl will not touch the water. When the water is simmering, place the bowl over the pot. Whisk the egg whites occasionally while it warms up then whisk it constantly. 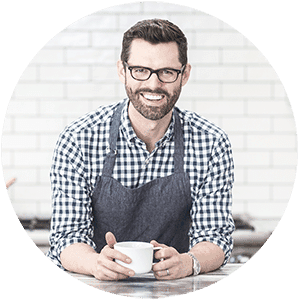 Heat the mixture until it reaches an internal temperature of 160F then transfer to a stand mixer. With a whisk attachment, whisk until you get room temperature, glossy peaks. Switch to a paddle attachment and while the mixer is running on low, add tablespoon sized dollops of room temperature butter. Make sure to let each piece incorporate before you add the next. Once all the butter is incorporated, add the vanilla and transfer it to a piping bag. Once you’ve frosted your cake, place it in the fridge to chill for 20 minutes or so until it’s firm. 1. Start by sketching your idea out. I always measure the height of my cake as well as the length I expect the scene to be. The sketch can be really rough, it’s just a guide. You can also make notes for colors to help guide your palette. 2. Mix your colors up. For this cake I used several palettes and mixed a bunch of tones up. You can mix from primary colored dyes or get a big set of Americolor gel food coloring, which works great. 3. Start painting the background. You don’t have to worry about blending the colors at this point, just get color onto the cake. I used a small brush but a palette knife would work too. 4. Once your background is roughed out, start blending! I used a big brush but a pastry brush would work too. Try using long strokes from light to dark areas and clean your brush frequently by wiping off with a paper towel. 5. Now you can begin painting details in the background. In this case those are trees, which I am painting with a light green buttercream using a small brush. 6. Paint your middle ground objects. My barn has a fair amount of detail so I’m using a small brush as well as a tooth pick. The pick can help you sketch onto the buttercream and remove colors to help define lines. 7. I have some big trees to paint so I’m using a bolder green since their close to the viewer and a palette knife to really lay lots of color and texture down. 8. I’m defining the snowy foreground with VERY light grey-blue mounds and more white buttercream to create contrast. Using a palette knife allows you to lay big patches of color down and not worry about brush strokes. 9. Finish off by adding any remaining details to the foreground. I painted a fence and some bushes using smaller brushes and toothpicks to remove any errant buttercream. 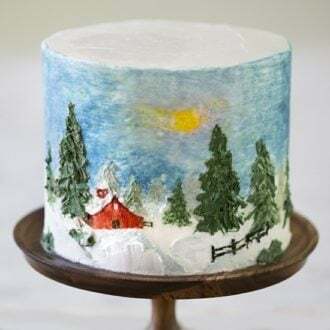 If you’ve tried this painted cake then don’t forget to rate the recipe and let me know how you got on in the comments below, I love hearing from you! 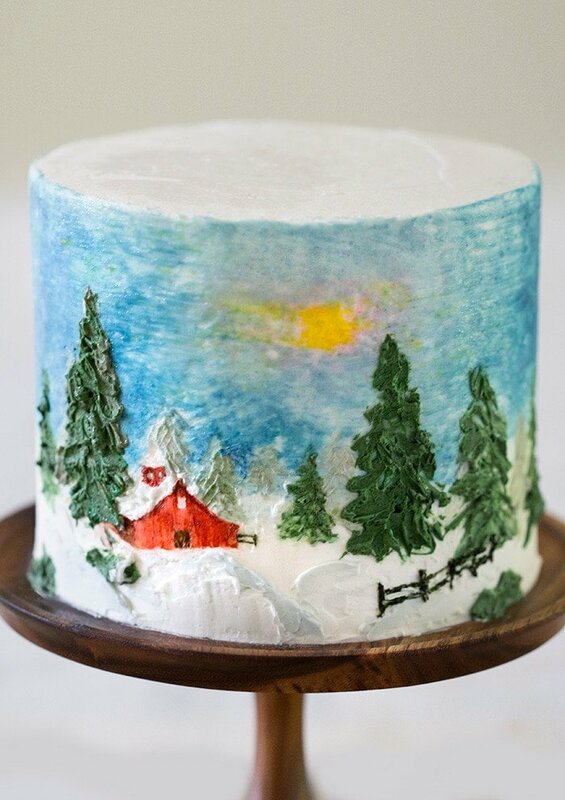 A delicious cake painted with a winter scene in buttercream! Painting with buttercream is easier than you'd think and so fun! Set oven to 350F. Butter and flour 4 6" cake pans (I recommend using cake stripes as well. 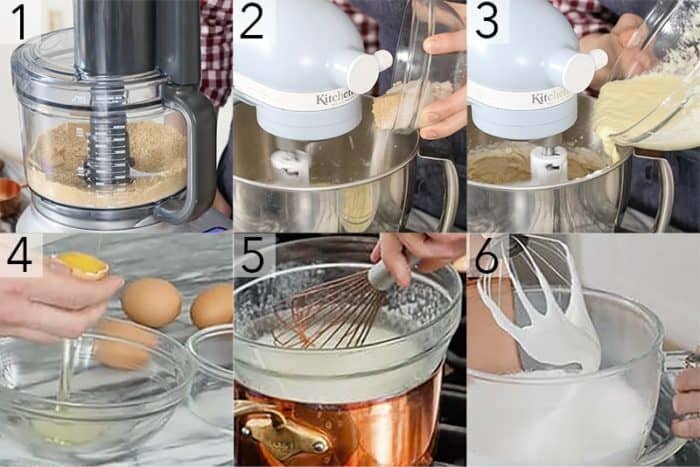 Whisk all the dry ingredients together in a medium bowl. In a separate bowl, mix the buttermilk, vanilla and sour cream. Cream the butter in a stand mixer and add sugars. Mix until light and fluffy. Add the eggs and white in one at a time mixing until incorporated. Add the flour mixture and the buttermilk mixture in alternating batches. Starting and ending with the flour mixture. Mix until just combined, give the bowl a final scrape with a spatula to get any unmixed parts on the sides and bottom. Pour batter into your pans and bake for about 30 minutes or until a knife comes out clean from the center. Pipe buttercream onto first layer and repeat until cake is assembled. Pipe on final coat of buttercream. Smooth with bench scraper and off set spatula. You can crumb coat your cake first then chill it to make the final coat easier to apply if things are wobbly. I love this so much. I used to paint for fun and canvas/paints became too expensive, so THIS is amazing!! Thank you! Beautiful cake John. The cake tasted great as well. I think this cake is absolutely delightful! Thank you SO MUCH for creating and sharing it!! And, yes, I would sure love to see additional cakes produced that are decorated in this style. Thank you so much! I will do my best to post more painted cakes like this one. I’m glad you like it!